Here we have it. 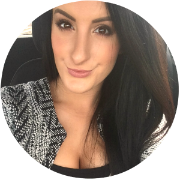 After makeup, skincare and haircare, the last post of my Best Of 2014 series, is body and nail favourites. 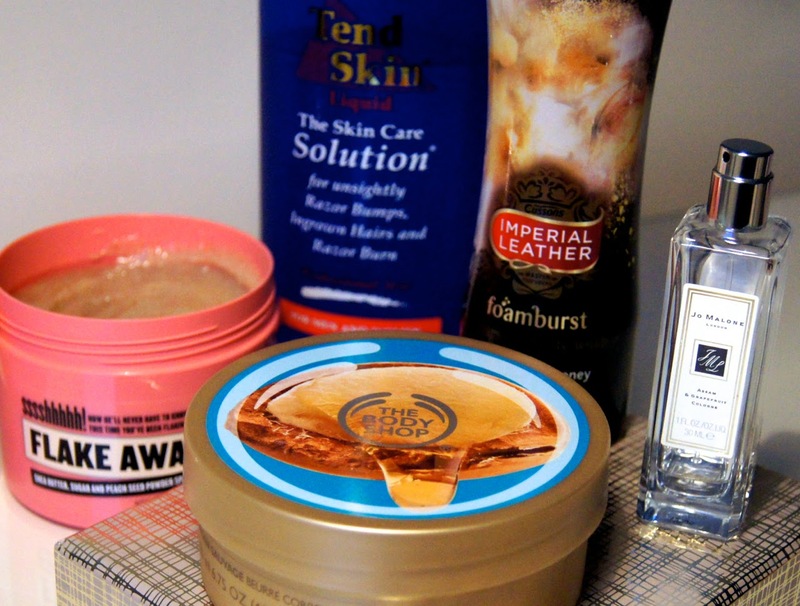 When it comes to body products, I don't like to spend a fortune, unless I'm really treating myself. There's so many affordable brands out there that offer effective products, so there's no need to splash out to get great results! The body washes that have made a constant appearance in my shower for at least six months, are the Imperial Leather Foamburst Luxurious Body Washes, with the Moisturising Honey & Almond Milk fragrance hitting my top spot. The unusual, gel-to-mousse formula gives you such a rich, creamy lather, that it makes the experience feel a lot more luxurious. Skin is left feeling lightly moisturised, nourished and smelling amazing. As always, my favourite body scrub comes from Soap & Glory. Their kitsch, deliciously-scented, body products have had me hooked from the word go and their scrubs are where it’s at. My most reached for product of their range is the Flake Away Body Scrub, by far. Even though all of the brand's scrubs are amazing, this one is super thick and has an almond oil element to it, giving it an edge over the rest. After use, the skin is left with a balmy, moisturising residue, which negates the need to use a separate, body cream. Whatever you do, do NOT exfoliate with this scrub prior to self-tanning, otherwise the colour will struggle to stick to the skin and could go patchy. I can’t get enough of The Body Shop’s Body Butters and, in particular, the Wild Argan Oil formula. Personally, if I'm going to bother with such a beauty chore as moisturising, then I go all in. So, I like my body moisturisers to be the type that give you baby-soft skin in just one or two uses. Super thick and rich, this nourishes even the scaliest, weather-beaten skin and restores it back to its best. I'm not one to moisturise in the morning, choosing to pack in as much shut-eye as possible, instead, so I don't mind that it leaves skin with a glossy, slightly greasy finish, as it fully absorbs as I sleep. Whilst it smells creamy, I'd say the neutral fragrance isn't too strong and won't overpower any perfume that you wear along with it. Every time I pass a Jo Malone store or counter, I can't help but pop in and, each time, I discover another gem. The most coveted fragrance from my collection, has to be the Jo Malone Assam & Grapefruit Cologne, which is a Selfridge’s exclusive. Perfect all year round, it has fresh, fruity top notes, which are paired with a deep, warming base. Initially, it's quite a zesty scent, thanks to the grapefruit, but as it dries, the almond notes come through and things get a lot sweeter. Cardomom and assam (black tea) gives the scent a rich, spicy edge and add depth. This scent is so addictive that I'm always in the mood for it and, because it's only available in Selfridge's and is harder to get hold of, that makes me lust after it even more! For the unglamorous category of hair removal, I thought outside of the box. Instead of picking a form of de-fuzzing, I chose a remedy for all the ingrown hairs, red bumps and itchy patches that can arise from shaving, waxing or any other method of getting rid of unwanted hair. The Tend Skin Liquid soothes the skin and magically reduces the signs of irritation in just a few uses and, if applied straight after hair removal, it prevents any from occurring. It's safe to use anywhere on the body and even my boyfriend sweeps a cotton pad soaked in the liquid over his beard area, after shaving his face. Although, you don't want to take this product anywhere near the eye area and the brand say it shouldn't be used on skin that has been chemically exfoliated, or if you have an aspirin allergy. My nails have never been particularly strong or healthy. I blame years of wearing false talons and a possible, nervous, biting habit (gross, I know!). So, to give them some TLC, I spent 2014 trying to keep topping up my talons with repairing base coats. My favourite of those I tried, is the OPI Nail Envy For Sensitive & Peeling Nails. One coat of this makes nails look smooth, even and healthy and, with continued use, applying a new coat each day, nails really do become noticeably stronger. Another product I used to help condition my nails, was the Jessica Phenomen Oil, which can also be used as a intensive, body treatment for dry skin, too. Formulated with natural oils, including jojoba, rice and almond, this is a potent blend! 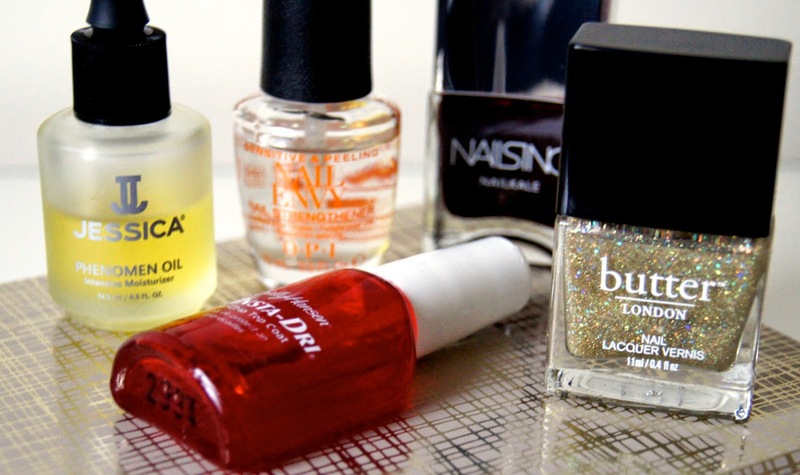 Cuticles are softened and nails are hydrated, leaving them smoother and less brittle. The little bottle can be popped into a handbag to use on-the-go and the handy pipette allows you to pump out the perfect amount of oil for each application, preventing mess and waste. I thought I’d mention a plain and glitter polish, for nail colour favourites. For a touch of mesmerizing sparkle, I chose Butter London Tart With A Heart, a translucent pinky-gold base full of grey shimmers and chunky, iridescent glitter. With just one coat, the effect is subtle and sheer. To get the gold base to be stronger, you need to layer at least three coats of the polish. I like to wear this shade over something pale and neutral to give a sophisticated look, but it transforms and looks different over every colour, especially dark shades. My plain, polish pick of the year, goes to Nails Inc. Nail Kale Polish in Victoria, a deep, cherry shade. The formulation of these varnishes is such a dream to apply. The polish is very gel-like and gives a smooth, translucent, glossy result, that only needs two coats to look perfect. Infused with kale extract, a superfood full of vitamins essential for healthy talons, the range is aimed at stimulating keratin production, to strengthen them. Whether or not it actually works, I'll always love the formula and I can guarantee I'll be buying more shades from the line. This year’s top coat favourite is the same as last year’s, my trusty Sally Hansen Insta-Dri Anti-Chip Top Coat. When I’ve finished lacquering my nails with colour, I wait a couple of minutes for it to settle and then apply a coat of this bad boy. In a flash, my tips are finished and I don’t need to avoid touching anything, in fear that my wet polish will smudge. Honestly, it dries in seconds. Nails are sealed with a glassy shine and a smooth finish and chips are minimised until I next paint my nails. 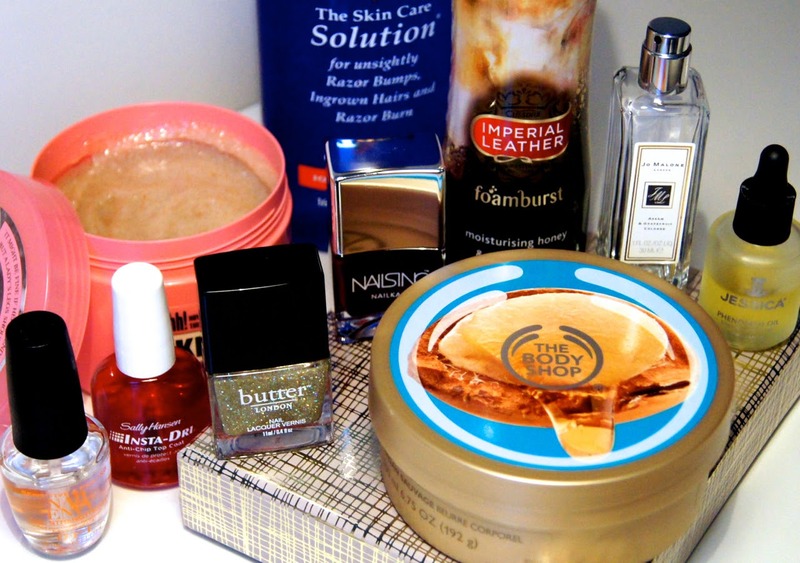 What were your body care and nail favourites of 2014? I love the Foamburst washes! The only thing that annoys me is that when you get to the end of it, it won't come out and you have to press the top for about 50 years!